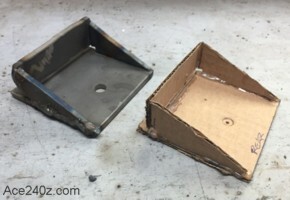 The RT Differential Mount is a great upgrade for all Z-cars, but if you own a '70 or early '71, it needs to be modified. For the differential, Nissan used a rubber mount bolted on underneath and a flexible strap across the top. The strap was supposed to limit any upward movement without transmitting any vibration or noise to the interior. It was cheap and worked OK, but Ron Tyler came up with a better version. 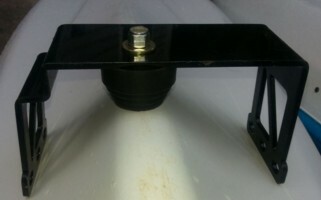 Commonly known as the RT Mount, it bolts into the same holes as the strap (which gets thrown away) and has a polyurethane "bumper" to limit differential movement. It's very well made, but doesn't fit the early cars. 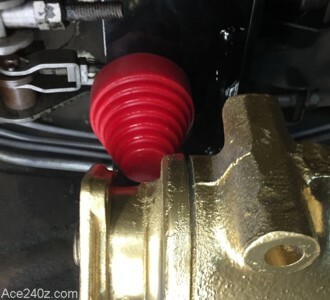 As you can see, the bumper is directly over the flange that connects to the driveshaft. 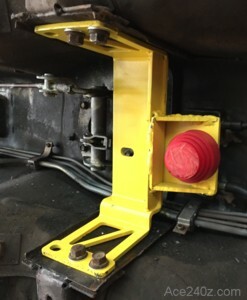 Above the bracket, the nut holding the bumper makes direct contact with the parking brake mechanism. Not good. Unless I was willing to go back to the strap, I'd have to modify the RT mount or build a new one from scratch. I decided to modify the mount and here's how I did it. I took off the bumper and bolted the mount into place. 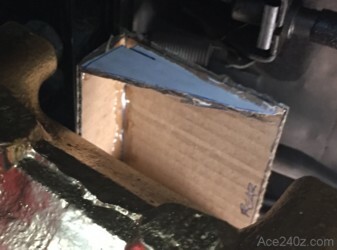 Using some corrugated cardboard and a little hot glue, I made a mockup for a bracket that would move the bumper rearward and clear the parking brake mechanism. It took a couple of tries, but cardboard and glue are pretty cheap. Not the prettiest thing I've fabricated, but it's rugged (12ga steel) and that's what counts. Here's the finished product bolted into place. Sure, the yellow paint is goofy but it makes me laugh. The bumper is centered perfectly over the differential case and I trimmed it back to leave a gap of about 1/8" between them. The nut holding the bumper no longer interferes with the parking brake cables. It took longer to make than I'd hoped, but that's something which happens all-too frequently with a 47-year-old car.